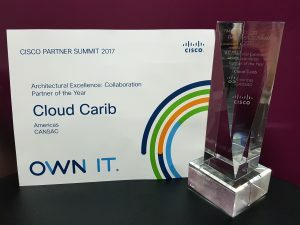 (The Bahamas) December 5, 2017 – Cloud Carib is excited to announce it has been recognized by Cisco as a Collaboration Partner of the Year for Architectural Excellence in the Americas and CANSAC regions. Cisco unveiled the winners during its annual partner conference taking place in Dallas, Texas. This award demonstrates Cloud Carib’s ability to consistently deliver collaborative cloud solutions that transform organisations and help support and facilitate their journey to the cloud.